Set 245, India looked beaten when they were reduced to 22-3 on an uneven pitch. Captain Virat Kohli could have been given out lbw to off-spinner Moeen Ali on nine, but survived to share a painstaking stand of 101 with Ajinkya Rahane. Even after Kohli was caught at short leg off Moeen for 58, Rahane dragged the runs required down below 100. However, Rahane and Rishabh Pant fell in successive Moeen overs, beginning a demise during which India lost four wickets for 13 runs as they were eventually dismissed for 184. 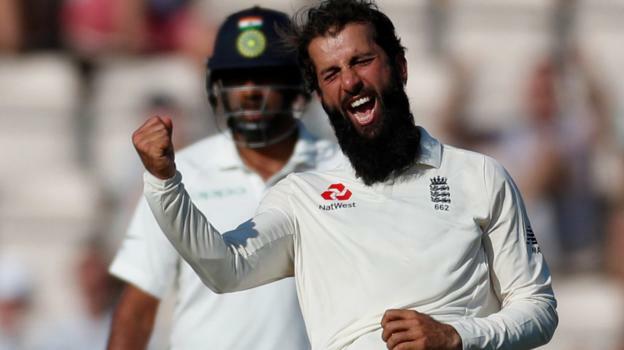 Man of the match Moeen, on his return to the side, ended with 4-71 to complete match figures of 9-134 to go with 40 runs in England’s first innings. Victory extends a run during which England have lost only one home series since 2012. They take a 3-1 lead to the fifth and final Test, which begins on Friday at The Oval. Resuming on 260-8, England’s first innings was wrapped up for the addition of only 11 runs and the game appeared to be set for a swift conclusion when Stuart Broad and James Anderson’s stump-to-stump line ran through the India top three. Indeed, India could have been as good as beaten by lunch. Third umpire Joel Wilson adjudged Kohli to have hit the ball, when contact looked to be bat on pad, to save him from being lbw to Moeen, and Rahane successfully overturned being leg before to Sam Curran on 12. The reprieved pair battled through the afternoon, playing and missing, nudging the ball square of the wicket and running hard. Their 100 partnership contained only five fours. Just as India were getting on top, Moeen struck. The delivery after a chance went in and out of Alastair Cook’s hands at short leg, Kohli gloved on to pad and, this time, a review could not save him. England were again in danger when the careful Rahane was joined by Pant, who hit 18 from 12 deliveries – an innings in complete contrast to his first-innings 29-ball duck. However, the outstanding Moeen, on the ground where he ran through India four years ago, had Pant held at deep point and ripped an off-break to pin Rahane in front for 51. England’s surge for the line was held up by the last-wicket pair of Ravichandran Ashwin and Jasprit Bumrah, Ashwin dropped at point by Anderson before falling leg before to Curran next ball. To beat the world number one side with a match to spare is a fantastic outcome for England and one that did not look likely after a run of poor results or when the hot weather seemed set to produce subcontinental-style pitches. However, the margin of victory does not tell the full story. England have emerged victorious in a fluctuating series that was ultimately played out in conditions that have suited them. They could have been beaten in both Southampton and the first Test at Edgbaston, while they were thrashed in the third Test at Trent Bridge. Their eventual success has been built on middle- and lower-order runs from Jos Buttler, Curran and Chris Woakes, backed up by a dependable bowling attack that has exploited the assistance offered throughout. But questions remain over a top order that continues to fail. England have used four different batsmen at number four over the course of the series, while there is doubt over the futures of openers Cook and Keaton Jennings. They also seem to be no nearer to knowing the identity of their premier spin bowler, a concern with tours of Sri Lanka and West Indies scheduled for the winter. Can anyone solve England’s top-order problems? India’s spot at the top of the world rankings will not be altered by this series defeat, but they will be left to rue squandered opportunities to record their first series win in England since 2007. At Edgbaston, they had England 87-7 in the second innings, only for the momentum to be reversed by Curran. Here, they let England reach 246 from 86-6 in their first innings and only mustered a first-innings lead of 27 despite being 142-2 at one stage. Although their turnaround to win at Trent Bridge after being hammered at Lord’s was admirable and their pace bowlers have consistently been excellent, India failed to fully capitalise on England’s weaknesses. India can point to an injury that hindered off-spinner Ashwin in Southampton, but too few of the tourists have followed the example of Kohli. The brilliant skipper has 544 runs, twice as many as any other player in the series and the most by a visiting batsman to England since 2006, but will still end up on the losing side. England captain Joe Root speaking to BBC Test Match Special: “There have been ups and downs throughout the series but the strength of characters of this group gets us through the most and we showed that for huge amounts of this game. I couldn’t be more proud of the team. India captain Virat Kohli: “Apart form Lord’s, I don’t think we’ve been completely outplayed in the series. It’s been fun – both sides have gone at each other with intensity. Stuart Broad’s dismissal of KL Rahul took him level with Sir Richard Hadlee and into eighth in the list of all-time leading Test wicket-takers. Virat Kohli’s tally of 544 runs is the second highest for an Indian in England, behind Rahul Dravid’s 602 in 2002. Alastair Cook’s two catches took him to 173 in Tests, surpassing New Zealand’s Stephen Fleming and moving him sixth on the all-time list.